The Kennedy Center hosts amazing live entertainment, music and shows. 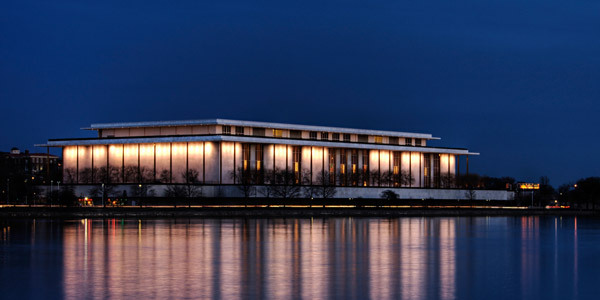 As a living and expressive memorial to President John F. Kennedy, the Kennedy Center fosters the finest in performance art, ranging from big-name concerts to ballet, opera and family-friendly theater. Experience the stirring classical music of the National Symphony Orchestra at the Kennedy Center - a must during any trip to Washington DC. Parking is available during performances on a first come first serve passes for $23.00. The garage is open daily from 6am to midnight. One hour of complimentary parking is available when visiting the Box Office or spending over $10.00 at the Gift Shop. What are some kid friendly programs there? The Kennedy Center offers a variety of year-round performances for young audiences, including NSO Concerts like Kinderclassics, Ensemble Concerts, Family Concerts, and Teddy Bear Concerts.